In the billowing winds of Flushing Meadows, the Arthur Ashe Stadium saw history being made on Monday. Scotsman Andy Murray became the first British man to win a Grand Slam in 76 years; since Fred Perry won Wimbledon in 1936. Murray had been runner up in four previous Grand Slam finals; 2008 US Open, 2010 Australian Open, 2011 Australian Open, and 2012 Wimbledon, but Murray’s season changed this summer, and new coach Ivan Lendl has done wonders with Murray, not just physically, but mentally. Murray used to be shaky in high pressure situations, but the past two tournaments has shown that Murray has changed, and can handle both the pressure of a final, and the physical demands. 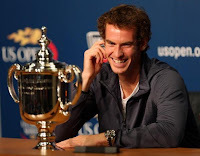 Andy Murray beat Roger Federer to win Olympic Gold in August, and although a great achievement, is not considered a major win in tennis terms. However this new found confidence strengthened Murray’s play – and led him to the US Open Final, and a match against old nemesis Novak Djokovic. Easily one of the greatest tennis matches I have seen, definitely since Nadal v Federer at Wimbledon in 2008, and elevated Murray for tennis player, to tennis contender. He even managed to raise a smile in the press conference!